In case you want to track your children everytime possible, iphone provide a great way to track your child using location service and findmyiPhone app. However it is very much possible that the children may turn off the location service which will bloc you from tracking your children otd kids movement. So if you want to lock location services on try below steps. Open Settings->General->Restrictions, and turn off Allow Changes, and check Locations Services. 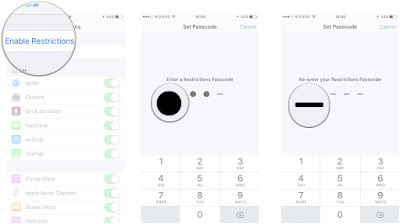 Make sure that you write down the passcode to safe place that you use for Restrictions, because if you can’t recollect that at later stage and wants to turn off the location service for some reasons, you will have to restore the iPhone to Factory to wipe the phone clean to clear it, and you cannot use your backup, because the passcode is part of the backup. There Will be no other way to reset it.